Dividend is a tax-free income in the hand of shareholders. Dividends are far more profitable today than it would have been in the last four years. ET Intelligence dug deep to find out companies, which are consistent in paying dividends and in some cases have also increased the payout ratio. This is because the stock prices have crashed in last one year, as result the dividend yield (dividend per share divided by price per share) has gone up. 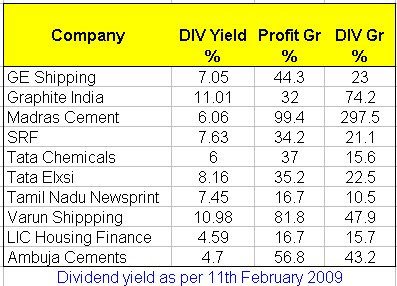 Therefore, the dividend per rupee of investment is much more today than it was earlier. However, investors should not aim at accumulating stocks with high dividend yield because such high yields may not be sustainable in case profit falls due to economic slowdown. ET Intelligence dug deep to find out companies, which are consistent in paying dividends and in some cases have also increased the payout ratio. A high payout ratio means a higher percentage of profits are distributed among shareholders as dividends. The payout ratio has come down for most of the companies in the table. For instance, Great Eastern Shipping paid 38.6% of its profits as dividend in FY 2003, which came down to 17.3% in FY 2008. The drop in payout ratio has to be seen in the light of high growth in profits. When profits rise at astronomical rates, the dividend growth tends to be a bit lesser because the company prefers to retain some amount with it for further investment. Investors interested in earning dividends should steer clear of companies with high fluctuations in profits. For instance, Tata Motors had incurred losses in FY 2001 and FY 2002. Though the company is incurring losses, it can still pay dividend from its past cash flows. But sustaining dividend payment will become extremely difficult in near future. Similarly, other auto manufacturers, like Ashok Leyland, were also excluded from the sample because they operate in highly cyclical industry. As we all know that investing in stocks is a risky affair, so, an investor should always try to balance his investments between stocks and fixed interest instruments, which are less risky. We did a simulation (taking the stocks mentioned in the table) to calculate the return purely from the dividend the stocks have been paying. We assume that an investor had put in Rs 1,000 in each of the 10 stocks on April 01, 2003, taking his total investment to Rs 10,000. The amount invested in all stocks was same to make a portfolio with equal proportions invested in different stocks. At the end of first financial year on April 01, 2004, the investor would have received dividends from the companies amounting to Rs 1,264. To minimise risk, we assume that the investor had invested the dividend in a fixed deposit for one year at the interest rate of 5.25% and then kept on rolling the fixed deposit every year for another one year. This is called ‘hybrid strategy’ , wherein the income from risky investments (in this case equity) is routed to relatively less risky investments (in this case fixed deposit). Similarly, every year on the first day of April, the investor would have got dividends, which he would have routed to fixed deposit of one year. Following this strategy, the investor would have made Rs 8,970 from dividend and interest on those dividends in five years. It is noteworthy that adopting this hybrid strategy the investor would have almost recovered 90% of his entire investment in five years time. This translates to annual return of 13.7% per annum from dividends only. The most interesting part of the result is that the investor would have made a much higher return on his investments than offered by any fixed rate instrument. On the top of it, that return would have had been entirely free from taxes. The interest on fixed deposit is taxed. As the interest earned formed a lesser part of the return; the tax incidence would also had been much lesser. Moreover, we have not considered the capital gains. The value of the total portfolio stands at Rs 46,302 today— close to five times of the principal amount of Rs 10,000—though the market has crashed by more than 50% since its peak. Couldn't agree with you more on dividend stocks. However, i have a difference of opinion about "sustainability". I think a good corporation with consistent growth can surely pay the dividends. Particularly the one that have low payout factors w.r.t EPS.